this is assuming Yurt is gone. Batts is a transfer candidate, it would seem. so obviously a lot can still change. but assuming Yurt is gone, we do have 1 scholarship available. would be nice to go after a grad transfer post player. all our other post players will be very inexperienced. seems like hopes are high for Daniels and Bryce. it's hard to know where to set expectations until the final roster shakes out. but i want to see us at a point where we aren't sweating it out on selection sunday and/or needing certain results down the stretch to secure a tourney bid. i would like to be comfortably in the tourney. Thata insane that we might have as few as 3 returning players! man...i'm in NC. you know how dumb carolina fans call us all farmers and then we all make fun of unc fans because we aren't all farmers and that's a ridiculous stereotype? well, i'm a farmer. i was up early watching the temperatures hover around freezing on our strawberry crop. so i had some time to kill on tww while i was thermometer-gazing. Offense was good this year, hope we figure out how to defend driving guards in the offseason. Offense should be better. The problem with our offense this year was that when it was clicking we could beat anyone, but often times we'd get too passive and we'd just force Freeman to take over on offense. Daniels + Bryce > Freeman + Hunt on offense. From everything that I've read from practice reviews, Daniels is going to be our star next year. I thought Bryce would be our new go-to guy but sounds like Daniels routinely abused our starters and I think Daniels and Bryce are going to be hard to keep off the court next year. Both are good scorers, capable defenders, and can shoot well. Bringing back Markell and Dorn is going to be imperative, we struggled at times on offense with our flow and decision-making without Markell on the court. Dorn needs to play the 4 for us, but he REALLY needs to work on his defending without fouling, it really hurt him late this season. The good thing about bringing in a guy like Harris, is that now we have a capable backup PG that can still keep the offense humming when Johnson needs a breather. I think Simons is a long-shot at this point, he seems to be a projected 1st round pick, can't see him playing in college. Most likely scenario is we bring in a post-grad 5, so I could see someone sliding into the starting 5 spot and splitting time with Funderburk. Defense should be improved, simply based on more athleticism on the court and more capable/experienced bodies to use a deeper rotation. I expect more pressure on opposing guards, and hopefully whoever is playing the 5 for us is a better rim-protector than Yurt. I really don't want to hear the name "Funderburk" for 4 years. Thats a Clemson level name. Pretty sure Brownell recruits based on how annoying your last name is. "The good thing about bringing in a guy like Harris, is that now we have a capable backup PG that can still keep the offense humming when Johnson needs a breather"
Harris was pretty much garbage in his time at Missouri, so I don't expect anything out of him next year, especially since he'll miss pretty much the entire non conference schedule. i could see dorn declaring. saw him in a few mocks recently. he has some great athleticism, and has been a great contributor for us this year. "I wouldn't be shocked if they take a step back if we don't do something about the lack of three point shooting "
We are losing Al Freeman and Sam Hunt, neither of which were knock down shooters. We are replacing them with CJ Bryce (43% from 3 last year) and Devon Daniels (40% from 3). I don't see shooting being a problem. Inside presence maybe. Losing Yurt will hurt on the offensive end, but I expect us to clear up our inside defense considerably. ^^^really? great rebounder for a guard, but is he a good enough shooter to get drafted? ^^Sam Hunt shot 41.8% from 3 this year, and Bryce shot 33% last year, not 43%. So yeah, that's not an improvement. "^^^really? great rebounder for a guard, but is he a good enough shooter to get drafted?" i think his stock rose enough this year to be a late second rounder for sure. he's the guy you want to see on the court, but won't be the one to lead in scoring. in some of our big wins, he's come thru with some critical baskets. I'd love to have him back next year, but wouldn't be surprised to see him declare. Seriously doubt he's gonna declare for the draft with a late 2nd round grade. "We are losing Al Freeman and Sam Hunt, neither of which were knock down shooters. We are replacing them with CJ Bryce (*33% from 3 last year) and Devon Daniels (40% from 3). I don't see shooting being a problem. " Daniels made 14 threes his freshman year at Utah. To put that in perspective, Yurt made 22 this year, so he's not even replacing that. Now, I expect that was one of the things he worked on while redshirting and there's decent history with Keatts' players that he gets them to increase 3 point attempts (plus most guys just become better shooters with more years in college), so he's probably going to shoot more next year...but I'm not expecting a ton. Bryce went from 12-27 his freshman year to 40-119 his soph. Dorn went from 27-79 at Charlotte to 24-66 and 23-74 here. Keatts' last team at UNCW had attempts of 289 (! ), 168 (guy in the Hunt role), 189, and 119 (Bryce). Now, that team jacked up a TON of threes, but that's how he put up a top 25 offense at a freaking low major (there were a couple other major factors as well, of course - you cant do just one thing well - but shooting threes helps spacing so you get high percentage 2s, probably limits turnovers since you aren't wasting time on entry passes, etc). IMO what we have for next year is Beverly in the Hunt role and three guys who could qualify for Bryce volume. Where are the other ~400 attempts coming from? Well, guys who jack up 300 threes with any efficiency don't exactly grow on trees, but IMO we really need to find one who can jack up 190 (Al shot 182 this season). I think all of our guards will have the greenlight for open shots next year outside of Batts. Johnson and Beverly shot well at times this year, Dorn can knock down some open looks but is a bit streakier, and it's kind of hard to say what to expect out of Daniels/Bryce/Harris after redshirt years. You would hope a year working on their game and knowing/learning the system would have them ready to step in and knock down some open looks. Offense might not be as heavy on 3's, but we should be more athletic and open up a lot of drive and kick opportunities for open looks. Just have to hope we knock them down. When we shot well this year we were really tough to beat, but when we inevitably went into cold snaps, we struggled against bad teams. Losing Yurt is going to hurt, but I think the overall athleticism at the 5 is going to improve going from Yurt/Abu/Freeman to Funderburk/Steere/Bates. We might struggle a bit inside on offense next year(though we've seen Keatts system make it REALLY simple for the 5 spot), but I expect we'll improve in rebounding and defense. The beauty of the 5 spot in Keatts system is that it should be fairly simple offensively: set screens, take open dunks, and collect rebounds. We don't need a stretch 5 in this system, so I can only hope that 2 of our new bigs can figure the system out. I'm expecting Beverly's game to step up big next year. I think if Beverly doesn't start, he'll be a much, much more efficient offensive player and not such a liability on defense. "can Funderburk start from day one? I read an article on him that got me hyped"
I'm a little concerned about next year's team." Yeah out of all the outcomes possible there I never thought a transfer was an option. I think everyone knew Yurt was 95% going pro...but the release part is a little bit odd. Oh well, he'll likely end up drafted and just go pro, don't see him transferring anywhere and sitting out a year. Well I wish Yurt the best of luck wherever he ends up, but I have to admit I would be kind of annoyed if he transferred to Kansas or something. I think they had the transfer part in Rowan's decision to leave the program as well. 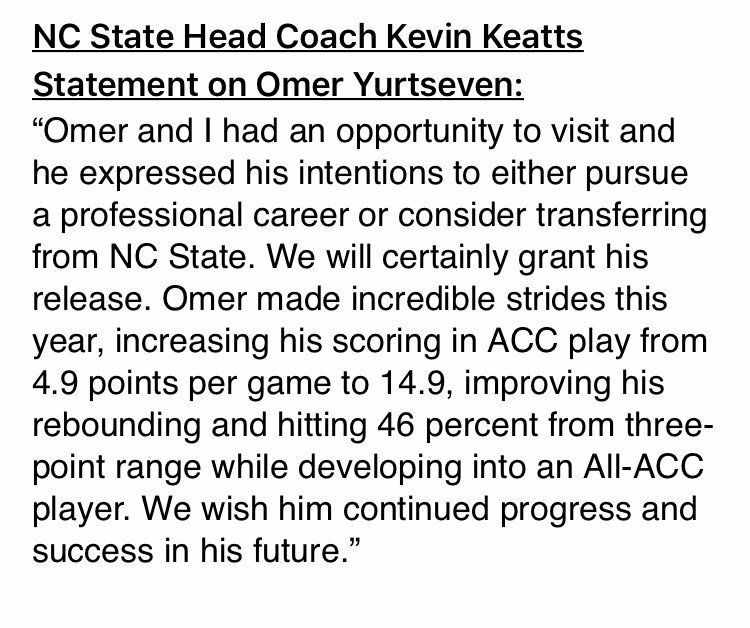 Guess Keatts didn't want the spot sitting around open waiting to see if maybe Yurt came back when he can go out now and start looking at post-grad options. ^^No, Rowan came out and said he was 100% not transferring. Didn’t expect him to be back next year. Would be nice to add a grad transfer post player. "Guess Keatts didn't want the spot sitting around open waiting to see if maybe Yurt came back when he can go out now and start looking at post-grad options." I don’t think that’s really the case. Scholarship numbers wouldn’t have to be finalized till much later. We could pursue other options while Yurt was still deciding. its probably because he doesnt fit in the system ans keatts doesnt want to change the system for yurt at tge expense of everyone else. its not a good fit. if he goes back to europe he would have just wasted 2 years anyway. Yurt G league MVP 2018/19. heard here first. What's up with this AW Hamilton interview stuff? Is he likely to get it? Is he likely to take it if he gets it? Is it a big loss if he does? Idk if he’s likely to get it. It’s in his home state and it’s a HC gig. I’d guess he’d probably take it if offered. Hard to know how big a loss it would be since he (and the whole staff) have only been here a year. Don’t think it’d be a back breaker or anything if he took it. But if schools think he’s good enough to be a HC then he must be doing plenty right. "if he goes back to europe he would have just wasted 2 years anyway." which is precisely the point. Why sit a year where you're not playing ANY games to play one year of basketball when he can just go back to europe(if he doesn't get drafted that is) and get PAID to play basketball. Bet Earl's employers love his attitude: "trying and failing is a waste of time, only do sure things!" Not surprising about Batts either, but it's gonna be wild with only Johnson, Dorn, and Beverly back next year. Yes, but only those 3 guys are coming back that played this year.